On this page is a detailed compound interest calculator, along with the compound interest formula and examples. The calculator allows you to calculate compound interest from a starting lump sum, periodic additions, and for annual, monthly, and daily compounding periods. The calculator also graphs the growth of the investment over time and report a final amount. Investment Starting Amount – The lump sum at the beginning of the compounding period. If you are modeling your portfolio, use “today’s value”. Periodic Investment Amount – The amount, in dollars, you add on a periodic basis. Periodic Addition Frequency – How often you add that amount to your portfolio. Periods to Compound – The number of periods of the below type that the deposit and additions will compound. Type of Periods – How often interest is applied. This field also affects the number of periods field set above (e.g. if you select ‘Daily’, make sure you enter the number of days to compound). Compound interest is a powerful concept fully worth grasping while learning more about your investment portfolio. At its heart: the money in your account earns interest, but the interest itself also earns interest. In a sense: the money your money earned eventually snowballs into a larger and larger base on which you earn further interest. The exact same concept applies when discussing dividends. Over a 40 year career, dividends and interest paid on previous dividend-reinvested shares can make up the majority of your portfolio. Starting with $1,000, how much money would you have if you put your money into a savings account with: a 5.5% APR, compounded daily, for 5 years? A naive calculation would say: $1,000 * 5.5% = $55 a year, multiply that by 5 and you get $275 for a total of $1,275 after 5 years. That’s incorrect, however. Plugging the numbers into the calculator, you get $1,316.50. And there you go: without a feel for compound interest, somebody could spirit away $41.50 with you none the wiser! 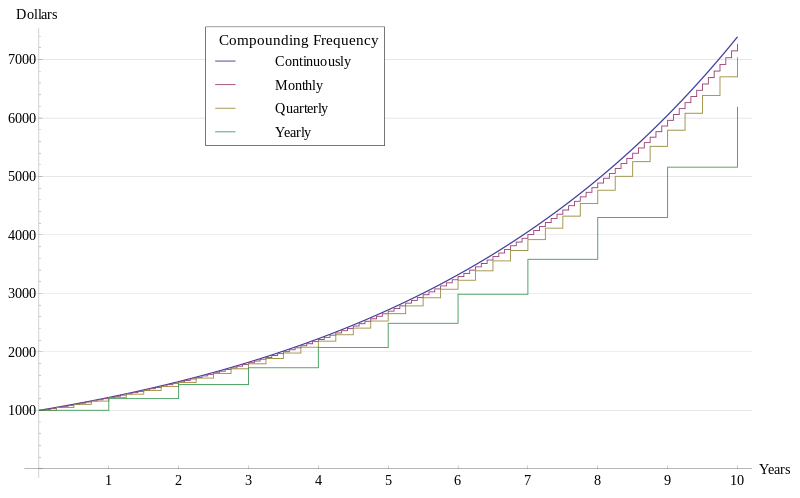 One of the variables we noted in the compound interest calculation was the idea of compounding frequency. 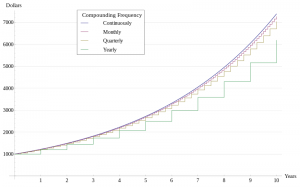 Think of compounding frequency as how often the compounding works on itself (compounding on compounding – it’s all compounding all the way down!). Daily compounding means the rate is applied to the balance at the end of every day. Likewise for other forms of compounding: weekly, monthly or annual. There is also the idea of continuous compounding, where the compounding is always happening on an instantaneous sum of money. As you can see, compound interest is a simple topic with some complicated details. In the end it boils down to one simple fact: interest works upon previous interest. Whether this helps you or hurt you depends on what side of the transaction you are. Heed Albert Einsteins advice, understand compound interest, and profit from it as much as you can.